I think I’ve finally figured out all those times my MacBooks and PowerBooks refused to connect to coffee-shop WiFi. I’d thought maybe some low-level hardware incompatibility, or some difference in the way Apple and router manufacturers had implemented the 802.11 specs, or a strange electromagnetic field generated by my fillings… but no. Those café networks just have a fear of intimacy. Maybe there was an “Is that all I am to you? A spam gateway?” conversation somewhere in their logs. For whatever reason, they had no interest in a long-term relationship — and certainly not long enough to give an IP address to every random laptop that swung by with DHCP on its mind. My Pokemon GO issue started innocently enough. Knowing there are three PokeStops between my downtown bus stop and the front door of my office building, I’d collect PokeBalls, raspberries and potions for my son. Then I’d notice Drowzees and Magikarp hanging out near the entrance, so I’d nab one or two before I went in. I might walk the long way around the Convention Centre to give some of his incubating Pokemon a chance to hatch. Onee I realized I was considering leaving a half-hour early so I could install a lure module in the Marine Building PokeStop, I knew it was time to draw the line. How’s the Magikarp trading against the dollar? This cartoon idea popped into my head when I came across this adorable post by the good folks at OpenMedia, cleverly connecting the Pokémon GO phenomenon with data caps. I’m a big fan of OpenMedia’s work on behalf of an open, affordable and surveillance-free Internet. They have their work cut out for them, because that vision of the Internet is being attacked on all fronts. OpenMedia is campaigning to stop link censorship and toll-gating, defeat the TPP’s assault on digital rights, protect net neutrality from telecos that want to shunt big chunks of the net into the slow lane; and much more. I hope you’ll consider supporting them. I’m on vacation, but couldn’t resist posting about Pokémon GO. It’s breakout success has already inspired many a “15 reasons your brand MUST be on Pokémon GO” blog post, but what’s a lot more interesting to me is where it goes from here. For now, Nintendo has unlocked a way to engage millions of people and have them give up reams of fascinating geo and behavioural data (set aside for now the privacy fiasco that marred its launch). Just what they do with that ability is anyone’s guess, but I don’t think they’ll be satisfied with just having users flick more Pokeballs into the aether. Learning to code will solve everything from youth homelessness to the mumps. My wife Alexandra Samuel has studied the way parents tackle their kids’ relationship with technology over several years now. Her two-year study of more than 10,000 North American parents has some fascinating findings that she covered at South by Southwest, in a session dubbed The Myth of the Family Tech Market. 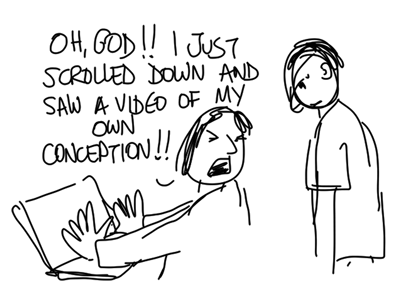 I drew seven new cartoons about parenting in the digital age for her presentation. Drawing is easy; digital parenting is hard &emdash; we’ve found it tremendously challenging with our own kids. Parents have to sift through mountains of wildly conflicting opinions, suggestions, warnings and prescriptions. And there are plenty of people ready to condemn you loudly and publicly for whatever technology choices you end up making. 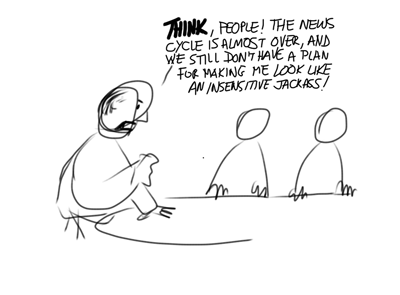 So I hope it’s clear these cartoons are meant with a lot of love. Parents are making hard choices every day based on incomplete information, being pulled in eighty different directions by people trying to sell them a product, a service or an ideology… and we’re expected to do it with confidence and certainty. The truth is, confidence is in scarce supply and certainty is just plain dangerous. We’re all stumbling through this, and a little compassion and mutual respect around conflicting choices will go a long way. I’m seriously going to have to turn in my geek credentials. I honestly thought he was still called Captain Marvel. Turns out he’s now going by Shazam—because apparently the only thing more powerful than Solomon, Hercules, Atlas, Zeus, Achilles and Mercury is a Marvel Comics trademark lawyer. Hey! There’s a book coming out from two of the sharpest minds in podcasting, Donna Papacosta and Steve Lubetkin, with a slew of new cartoons from yours truly. The Business of Podcasting hits the Kindle bookshelves on July 31—more on this soon! They’re calling Tuesday, April 21, 2015 “mobilegeddon”: an update to Google’s search algorithm that will give pride of place to mobile-friendly websites (and punish mobile-hostile ones). This site is, ahh, not all that mobile-friendly. (Don’t take my word for it.) So it’s been nice knowing you; remember me fondly. A combination of a webcomic plugin that isn’t upgrading as happily as it should be and a lack of time and (cough) MySQL savvy has kept me from making the changes that could give this that mobile oomph Google and I would like to see. I’ll aim to change that soon… but in the meantime, it’ll be interesting to see how big a hit I take. Updated: An important clarification from Search Engine Land: they say the changes affect mobile search results only. Which, given the number of searches coming from mobile these days, is mighty big… but it’s not everything. Further updated: Thanks to a dandy plugin called Duplicator, I decided to give upgrading this ol’ site – and in particular, the Webcomic plugin – one more try. And whaddaya know: Michael Sisk had just updated Webcomic with, among other things, “minor legacy upgrade fixes.” Whether one of those fixes did the job or the stars just happened to align properly, I’ve updated this site to the latest hotness… including mobile compatibility. Google, come and get me. Odd that I can’t find any guides to building your personal brand on Secret. I’ve tried Secret, the mobile app that lets you anonymously post about polyamory. No, wait, that’s not fair. Secrets lets you posts secrets about anything: how much you hate San Francisco, how real and down-to-earth you still are even though you cashed out big-time in that last Google acquisition, or polyamory (and specifically, how you’re engaging in it right now). In theory, you can post about anything else, too, but let’s be real. The near-complete anonymity ought to mean you see less attention-getting clickbait, but I was seeing a lot of “Swipe right if you agree with this statement that you’d have to be an inhuman monster to disagree with.” People, there’s no need to recreate Facebook. For that matter, any time I posted something, I obsessively checked the stats to see if anyone had liked it. It’s possible I just can’t handle anything with metrics. I’m having my own wearable-computing issue these days: between my Fitbit Flex, my watch and the Rainbow Loom bracelet my daughter made me, my left wrist is getting crowded. Because you’re never fully dressed without Bluetooth. Somewhere up there, I know she’s all smiley-face down at us. I’m not sure when it happened. But at some point my laptop and smartphone stopped being places of work, creativity, conversation and leisure, and started being the dashboard of a highly-strung car. Suddenly, I’m surrounded by notifications. And it’s all too much. Because every one of those notifications conveys the same red-badged “deal-with-me-NOW” sense of extreme urgency, whether it’s a DM that my house is on fire and I should do something about it, or the announcement of the new Rabid Parakeet in Angry Birds. When everything’s important, nothing’s important. The first few times I experienced notifications, I felt like the Terminator, with that cool heads-up display constantly alerting me to my surroundings, feeding me tactical data. After a while, though, it just feels like being 10 years old in the back seat with a pesky sibling who keeps poking you in the side. Besides, once I have badges on my iPhone apps with numbers like “62” on them, the game is lost anyway, and all that those notifications are doing is rubbing salt into the wound. Can we all acknowledge a debt to Rep. Anthony Weiner for providing the kind of crisis management case study that will make PR instructors’ lives easier for generations to come? And that’s that, folks – now go do some funny stuff so I have things to draw this time next year. Originally published on ReadWriteWeb with “mastodon” misspelled. Past generations would be utterly baffled by some of the challenges parents and kids face today. True, we don’t have to write notes to school like “Dear teacher, Monique won’t be attending classes today because our entire village was wiped out by the Black Plague,” or arrange birthday parties at the mastodon petting zoo without the benefit of Evite or Facebook Events. But technological advances bring their own unique issues to contend with. Our parents’ and grandparents’ generations never had to wonder whether to tweet that cute thing their kid just said, or if they should ask permission first. They never had to worry about their kids’ privacy when half their peers are sharing smartphone photos on Facebook and videos on YouTube. They never had to vet hula hoops and Monopoly games for adult content, security issues or in-app purchases. In short, sure: maybe they walked to school uphill both ways through three feet of snow nine days a week. But they didn’t have a peer group expecting them to check in on Foursquare when they got there. Outline your next blog post. Maybe you can’t do the research you want, find the URLs of the posts you’d like to link to, or hunt down the perfect Creative Commons image to illustrate your post. But you can sketch out the bare bones, and add the muscles, organs and stylish accessories once you’re back online. Clean up your hard drive. If you’re like me, you have little snippets of blog ideas and drafts all over the place. Bring them together in one folder, or one text file (your workflow will vary), and you’ll be miles ahead of the game next time you’re stumped for a post idea. Raid your subconscious. Break out the mind-mapping software, open up your Moleskine or just scribble on a napkin – but brainstorm ideas for your next five, ten or fifty posts. Don’t try to assess them at first; just get as many down as possible. Then, once the storm peters out, pick out the best and add them to your idea file. Make a to-do list. Chances are there are things you’ve been meaning to do for your blog: add a Delicious feed, check out an e-commerce plug-in, create a promo card to hand out at conferences. Set priorities according to the effort each task will require and the impact you expect each one to have, and you’ve just built yourself a development queue. Doodle. Draw something funny, or funny-ish. Then snap your doodle with your camera phone or digital camera. Once you’re online, upload it as a blog post. Hey – it works for me. Which means customers are bringing the competition into the bricks-and-mortar stores with them — and they can switch allegiance as easily as point, click, swipe, call up the keyboard, tap tap tap, dammit, backspace, no, that wasn’t it, tap tap (repeat eight or nine times)… submit. So maybe stores should think twice this holiday season about trying to trim costs by thinning their staff. 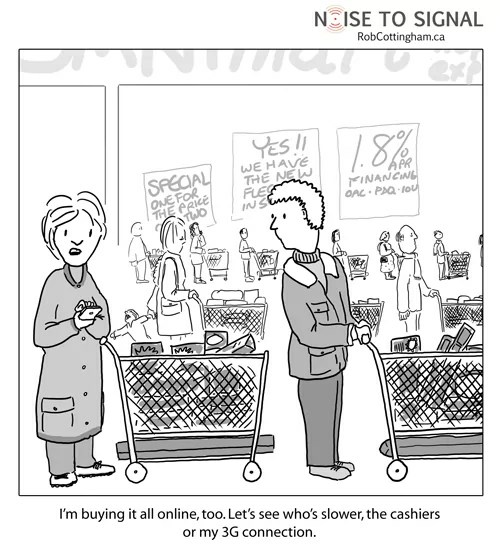 Longer lineups don’t just discourage shoppers, they give them the means, motive and opportunity to shop elsewhere. That said, just abandoning your cart would be kind of a dickish thing to do. Forcing those overworked staff to restock all the stuff you took off the shelves – that just isn’t in the Festivus spirit.